Honeyvilles Premium Quality Quick Rolled Oats are an excellent nutritional food source for family preparedness. Rolled oats are a rich source of soluble fiber, protein, and vitamins. Just 3 grams of soluble fiber from oatmeal daily, in a diet low in saturated fat and cholesterol may reduce the risk of heart disease. A thirty day regimen of 1 bowl a day of rolled oats will actually aid the body in the removal of cholesterol. Our Quick Rolled Oats come in a sealed #10 can with an oxygen absorber included for increased shelf life and freshness. Each #10 can is about the size of a large coffee can or a gallon of paint and holds 10 - 11 cups of rolled oats. Each case contains 6 #10 cans of Quick Rolled Oats. Product Application: May be used as a delicious hot cereal, or as a healthy and flavorful ingredient in oatmeal cookies, multi-grain breads, and rolls. 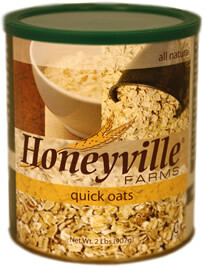 Shelf Life: Honeyville Quick Rolled Oats may be stored in the original sealed, oxygen-free can for 10 to 15 years under ideal storage conditions (a cool, dry place).